You can get a bowl of laksa, a spicy seafood noodle soup, at any hawker centre, but Singapore's east coast traditionally lays claim to katong laksa -- regarded as a quintessentially Singaporean dish. 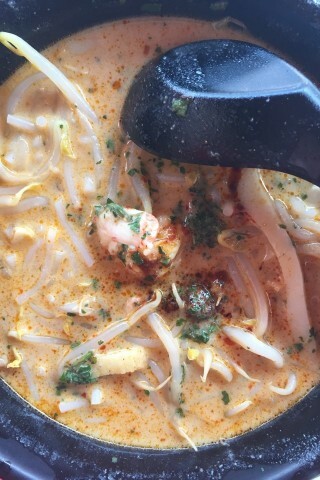 In this variant the broth tastes more of curry than coconut milk and the noodles are diced so they're easy to ladel in the spoon with cockles, fishcake and bean sprouts. Chilli paste is served on the side to allow you to control how explosive the dish is. Dishes come in two sizes -- the smaller was plenty for us. Overall this is a hearty and very satisfying meal and even if you're not a big fan of spicy soups, katong laksa is worth a try at least once. 328 Famous Katong Laksa insists they invented this particular dish and has a loyal local following. The restaurant presents a veritable wallpapering of press coverage -- both local and international, Gordon Ramsey is a fan apparently -- so you'll have plenty to read while you slurp your way through a bowl. Seating is available in both air-con and outside and they have a couple of locations along East Coast Road. 328 may claim to be the original, but the competing laksa shops on East Coast Road are often just as good — it's a memorable meal regardless where you end up -- just don't wear your favourite white shirt.